Orwell Pannier Market was set up in 2004, initially as a means of enabling villagers to sell surplus produce. The idea was formed when two Orwell ladies, Katie Reid and Pauline Broad, went on a cycling holiday in Devon. They spotted a sign for Bideford Pannier Market and, curious, went to investigate. They found villagers gathered in their village hall selling produce from wicker baskets. They thought this was a wonderful idea. Katie was saddened to be wasting so much surplus fruit and veg from her garden and her friend Pauline Aslin, a Wimpole bee keeper, had been looking for an outlet for her honey. Why not try a similar idea in Orwell? Once home they began telling people about it and quickly discovered others in the village who had something to offer. One lady made delicious pies, one enjoyed painting decorative plant pots, another made lovely homemade cards. The whole idea slowly began to take shape. Local regulations covering such matters were investigated and two hours a month seemed ideal. The original venue was the football pavilion and, as it had a small kitchen, another couple of ladies offered to serve teas, coffees and homemade cakes. And so Orwell Pannier Market was born. Why the word ‘Pannier’? Well, it’s Devon slang for a fruit and veg market, probably derived from the name for the baskets in which the market traders carried their goods.! It seemed fitting somehow! Within a few months I had joined them, selling surplus trout from my fishing ventures or seasonal game, and it wasn’t long before the number of stalls had outgrown the venue. 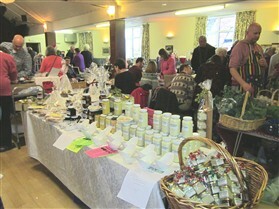 The market relocated to the schoolroom at the Methodist Church. Even that wasn’t large enough to house everyone so there were always three or four of us outside, braving the weather! But by now it had become a regular village fixture on the first Saturday of the month. Four years later it became clear than an even larger venue was needed. So in 2010 the move was made to Orwell Village Hall. Initially it was rather overwhelming to have so much space. But at least everyone was inside in the warmth! Sadly the Paulines moved away and, fearing it could mark the beginning of the end, I offered to help Katie run the market. 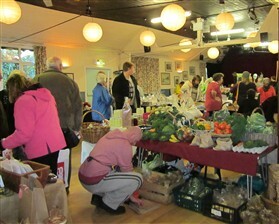 My job is to contact and recruit the stallholders, while Katie sets the hall up and deals with the finances. We needn’t have worried - word continued to spread and gradually stallholders from other villages and beyond began contacting us asking for a stall. By 2015 the market had become the biggest local village market, offering a wide variety of food stalls and local crafts and cards. We regularly average 23 stalls each month, and for our extended Christmas market we squeezed in 32! Our policy has always been to avoid competition and concentrate instead on stalls offering something different. So, for example, our food stalls range from the traditional fruit and veg, homemade bread, cakes and preserves, to local meat, game, trout, cheese, Indian dishes and spices, delicious pies, pasties and sausage rolls – even homemade ice cream in the summer! And again there’s a huge choice of craft stalls, from the more traditional homemade greetings cards and jewellery to a woodturner, blacksmith and stonemason. From beautiful hand sewn cushions and soft furnishings to quirky cake stands and hand-painted tiles. From unique hand-crafted handbags and hats to childrens toys and books. Plus winter bulbs and, in the Spring, homegrown flower and vegetable plants. Many of our stallholders have been coming for years and we all have our ‘regulars’. But equally it’s lovely to be approached by new stallholders who’ve heard of us and want to give us a try. The tearoom too has become extremely popular and offers bacon butties as well as homemade cakes. It’s become a great place for friends to meet, and is always packed. So why has Orwell Pannier Market become so popular? Why has it survived when others have fallen by the wayside? There are many reasons I suspect. A wide variety of stalls certainly, and a fair price for a stall (if you don’t sell you don’t pay). But mainly I think because it’s so busy and has such a lovely jolly atmosphere. If you’ve never visited us, come along and see for yourself! This page was added by Val Rees on 11/02/2015.